These relationship quotes and sayings are for everyone. No matter how young or old you are, there is always something new to learn in a relationship. Learning about the secrets and wisdom behind successful relationships can go a long way in helping you sustain better and long relations. Here are some great relationship sayings that can give you better and deeper insights. Some of reflections can bring a smile to your face, some can inspire you and some can give you great advice. 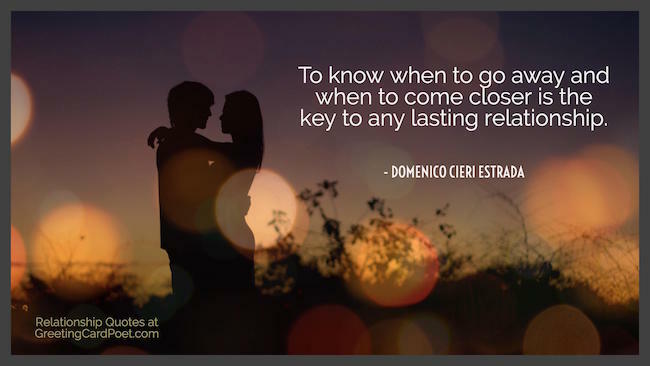 Check these wonderful relationship sayings or share with your friends and loved ones. The purpose of a relationship is not to have another who might complete you, but to have another with whom you might share your completeness. Love is no assignment for cowards. The one who loves least controls the relationship. If we are incapable of finding peace in ourselves, it is pointless to search elsewhere. If a relationship is founded on love it doesn’t end. It’s important to know when a relationship has run its course. Sometimes all you can say is, I’ve learned all I can learn from this person and we’ve grown all we can together, and it’s time to move on. The greatest mistake we humans make in our relationships; We listen half, understand quarter, think zero, and react double. Remember to hold hands and cherish the moment for someday that person might not be there again. Give time to love, give time to speak! And give time to share the precious thoughts in your mind. Two people in love, alone, isolated from the world, that’s beautiful. No, this is not the beginning of a new chapter in my life; this is the beginning of a new book…. Look, it is the first page! And it is a beautiful one! I know you think I’m crazy. Maybe that’s because I am. About life, about this moment, about you. Before you begin a relationship with someone, make sure that your relationship with yourself is where it needs to be. For every new relationship, there’s at least another new broken heart. Take your time, because relationships that start fast, end fast. New love may soar and plummet as it ebbs and flows, but what remains are the things we’ve discovered about each other. I’d do it all again because it led us to this love we share today. All I know is that you’re the nicest thing I’ve ever seen, I wish we could see if we could be something. You have to walk carefully in the beginning of love; the running across fields into your lover’s arms can only come later when you’re sure they won’t laugh if you trip. New love can heal lost loves, but it cannot make you forget. One genuine new relationship is worth a fistful of business cards. New month, new intentions, new goals, new love, new light, and new beginnings. Since I met you, I started to understand why all my past relationships ended: so that we could start. That’s why they call them crushes. If they were easy, they’d call them something else. My wife and I were happy for 20 years – then we met. Never marry a man you wouldn’t want to be divorced from. If we take matrimony at its lowest, we regard it as a sort of friendship recognized by the police. The most important thing in a relationship between a man and a woman is that one of them must be good at taking orders. What I really need is a woman who loves me for my money but doesn’t understand math. If Jack’s in love, he’s no judge of Jill’s beauty. A man who correctly guesses a woman`s age may be smart, but he’s not very bright. Then I realize what it is. It’s him. Something about him makes me feel like I am about to fall. Or turn to liquid. Or burst into flames. When in a relationship, a real man doesn’t make his woman jealous of others, he makes others jealous of his woman. To love someone deeply gives you strength. Being loved by someone deeply gives you courage. For the two of us, home isn’t a place. It is a person. And we are finally home. Like the bees which keep collecting honey, you take a piece of me every day. I am so enchanted by your sweet smile and your loving affection that I will never be able to let go. Flowers swing by the breeze that blows in the evening just like your love makes me dance, sing and get excited each and every day. I don’t need a reason to love you, just like I don’t need a reason to believe that God and love exist. All I need to do is love you more and more and more each day. I like the fact that you are funny and good looking. But the best thing I love about you is that you care so much for me and feel like a million dollars. One day you will kiss a man you can’t breathe without and find that breath is of little consequence. Promise me you’ll never forget me because if I thought you would, I’d never leave. I loved you like a man loves a woman he never touches, only writes to, keep little photographs of. So, I love you because the entire universe conspired to help me find you. If I had a flower for every time I thought of you … I could walk through my garden forever. You don’t love someone for their looks, or their clothes or for their fancy car, but because they sing a song only you can hear. The real lover is the man who can thrill you by kissing your forehead or smiling into your eyes or just staring into space. Tip: These relationship quotes work well as photo captions on Instagram. The most exciting, challenging and significant relationship of all is the one you have with yourself. Don’t settle for a relationship that won’t let you be yourself. That ‘Love never means you have to say sorry’ stuff doesn’t cut it. Say sorry, forgive and forget. Three things I want in a relationship: Eyes that won’t cry, lips that won’t lie, and love that won’t die. The extent to which two people in a relationship can bring up and resolve issues is a critical marker of the soundness of a relationship. 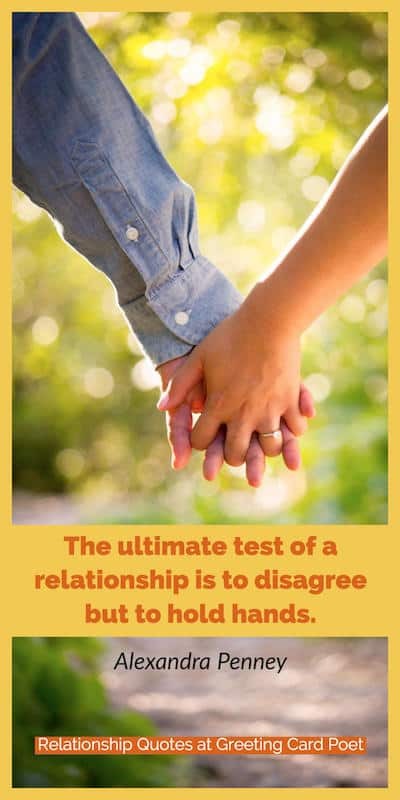 The ultimate test of a relationship is to disagree but to hold hands. Real giving is when we give to our spouses what’s important to them, whether we understand it, like it, agree with it, or not. After a while, you just want to be with the one who makes you laugh.